Today I returned to the Kanto Region to report from Kamakura, a popular tourism destination about an hour south of Tokyo. 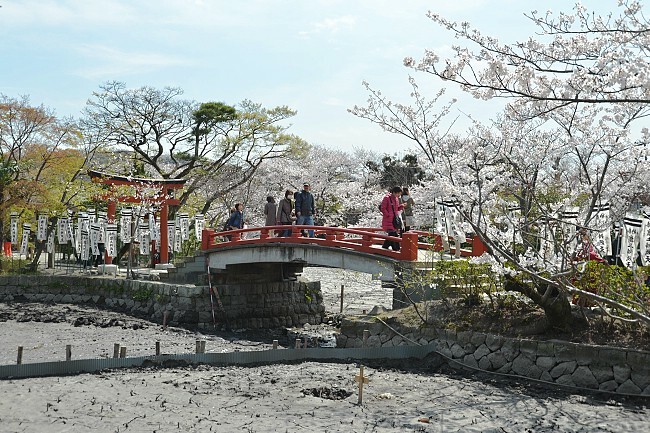 Even though they are not very far apart, the cherry blossoms in Kamakura opened about half a week later than those around Tokyo. Yet they have been keeping about the same pace of progress, and have just reached full bloom across the city. 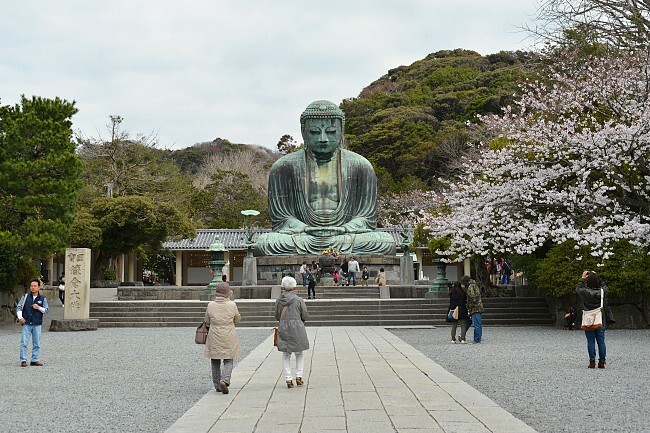 The Great Buddha (Daibutsu) is Kamakura's most popular and recognizable tourist spot. 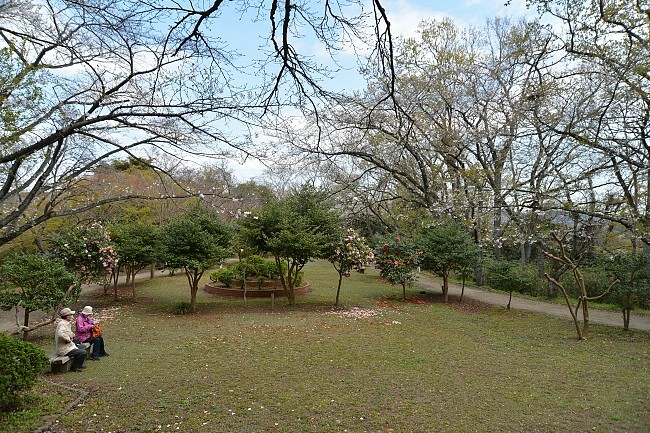 Several cherry trees are planted around the grounds of the large bronze Buddha statue, especially in a small grove near the entrance of the temple grounds. 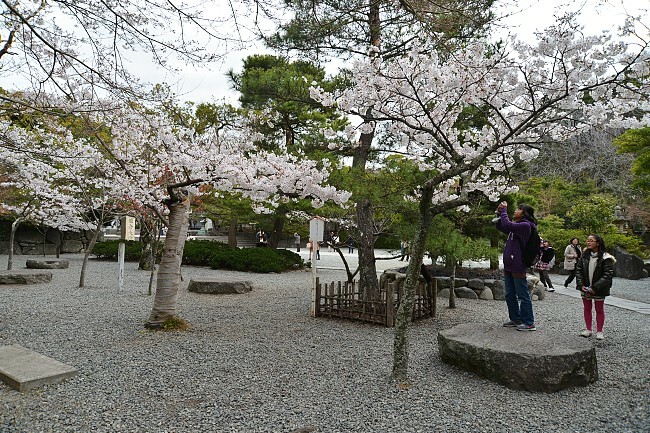 There are not many trees directly around the statue, but there is one that is very strategically placed in such a way that lets you take pictures of the statue in combination with cherry blossoms. 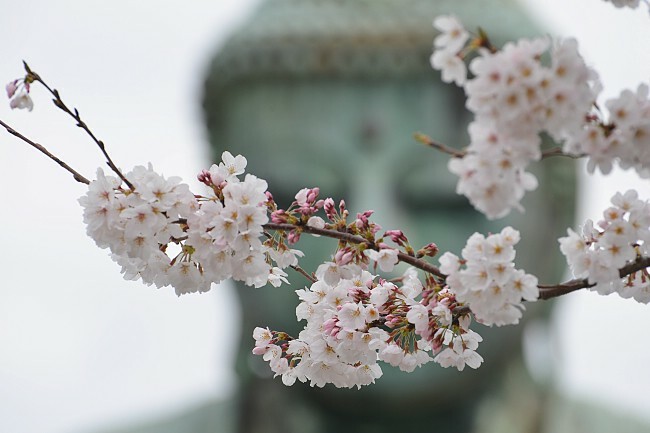 Most of the cherry blossoms around the Great Buddha were at full bloom today, while the tree in front of the statue was slightly behind the curve and only about 75% open. The blossoms should remain nice through the week with ideal weather; however, there is a decent chance of rain over the next few days that could have potentially negative effects on their lifespan. 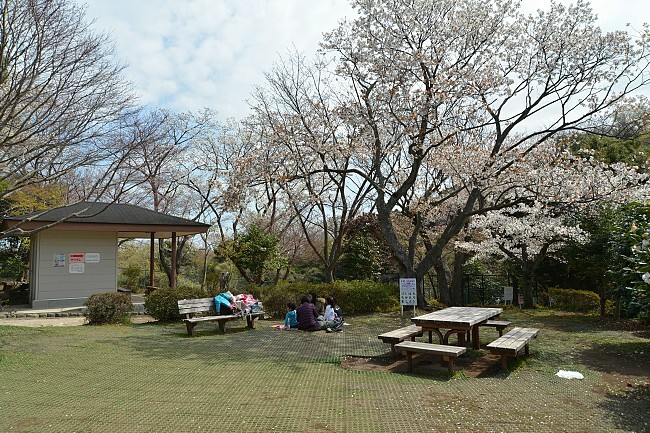 Genjiyama Park is a small park in the western hills of Kamakura along the hiking trails that connect the Great Buddha with Kita Kamakura. 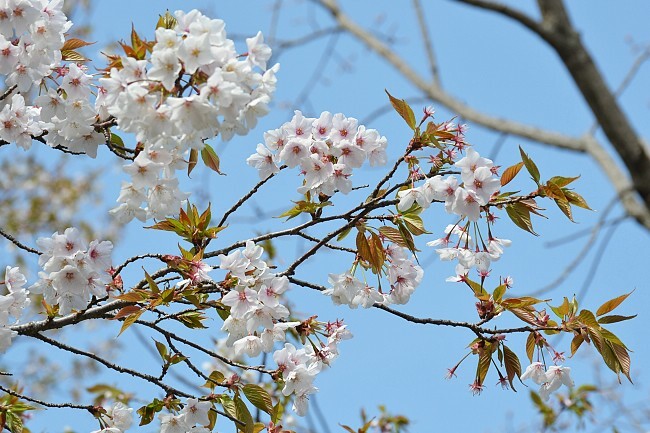 There are about 300 cherry trees spread out around the park, mostly of varieties such as Yamazakura, Oshimazakura, and Yaezakura rather than the elsewhere more common Somei Yoshino trees. The cherry blossoms today were sort of a mixed bag. 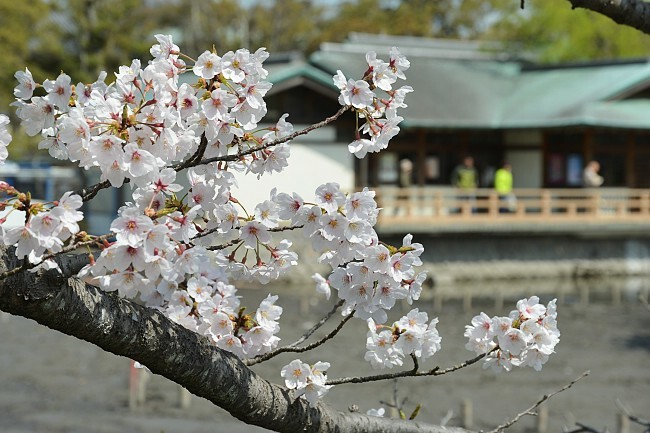 About half of the trees follow a similar timing as the Somei Yoshino and were at full bloom. However, the other half of the trees were later blooming types which were still closed. As a result, there was a sort of patchwork effect going on where things looked either full bloom or still closed depending on the particular direction you were facing. 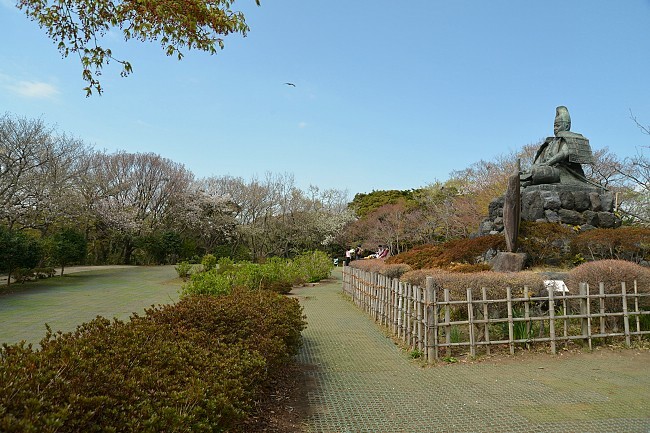 This was most apparent around the main grassy area of the park that surrounds the statue of Minamoto Yoritomo. Other parts of the park had mainly one type of tree or another so they didn't suffer the same effect. In the end this probably means that the park will have a slightly extended season, and I would expect it to look even better once the later blooming trees get going. My final stop today was Tsurugaoka Hachimangu Shrine, a very large and popular shrine near Kamakura Station. 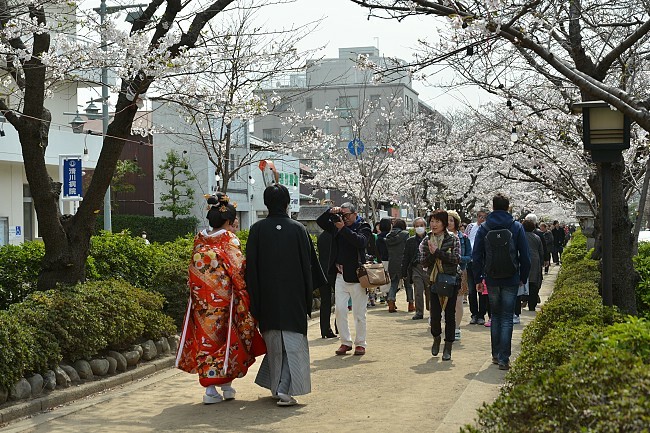 In spring, the tree lined approach that leads from the station to the shrine (Dankazura) becomes one of the city's most famous cherry blossoms spots. 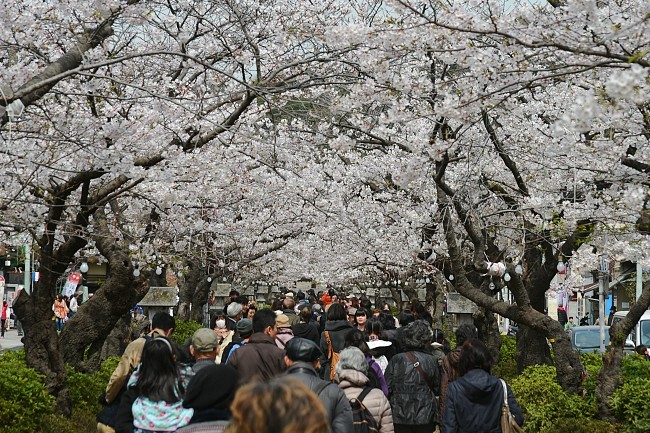 About 300 cherry trees are planted along this 500 meter long path and form a cherry blossom tunnel that can be enjoyed as you walk toward the shrine. 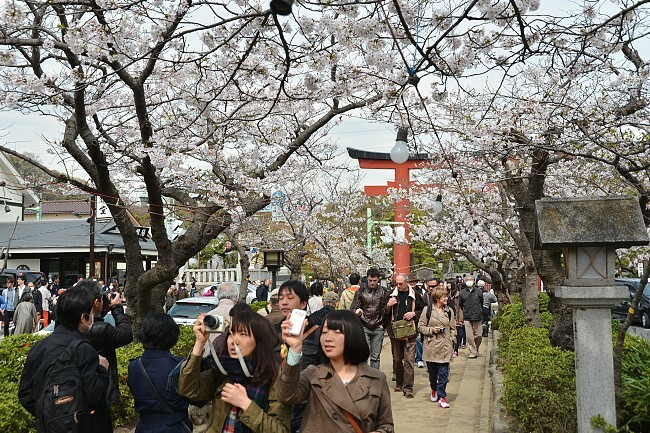 The cherry trees along the Dankazura have reached full bloom and were being enjoyed by thousands of visitors today. The blossoms looked nice and healthy and should last to the weekend assuming the weather is not too bad over the next few days. Unfortunately there isn't any space underneath the trees to hold a hanami party. The main shrine grounds were also very crowded today as people came to check out shrine and the cherry blossoms that lined the shrine's large pond. The cherry trees there were also at full bloom, however the atmosphere wasn't quite as nice as usual as the they had drained the pond for some reason.